My my, does it seem like a long time since I’ve done a recipe post! It’s completely true, absence does make the heart grow fonder. And in full disclosure, my heart needed to experience a little longing, indeed. I’m so happy to be back in the swing of things, fully immersed in the forward momentum of this new year, eyes wide open and heart willing, with my gears well-greased and my thoughts on brand new recipes and a couple of soul-inspiring features to joyfully bring to you in this upcoming year. If you haven’t already noticed, or haven’t yet had the chance to take a little peak, my husband and I have added a new, food-related short film series called “Food Meditation”, which we plan on bringing to you once a month in hopes of offering up a peaceful little space to quiet your mind, reflect and relax. Each of us could use at least of few minutes of that, couldn’t we? In the next couple of weeks, I’ll also be introducing another feature that will be more of a personal, non-food related post on a topic that I’m hoping will open up the door to us sharing together, in a sort of on-line “discussion”. It’s a post designed to help us connect with one another, and to bring to this table our own unique perspectives and experiences on a given topic. So stay tuned for those goodies! I’m very much looking forward to those. To be frank, throughout the holiday season this year, things felt a little “touch-and-go” there for a while in regards to feeling like perhaps this would be one of those holidays that would end up being rather forgettable. I felt like my attitude needed to be adjusted, and those rose-colored glasses that I so often look through, cleaned. Both my husband and I felt like we tried and tried, but somehow couldn’t shake the feeling of mild discouragement about the state of things around us. We shared at the on-set of the holidays that we felt like we were both lacking that “cheerfulness”, and were having a tough time getting into the spirit of things. But rather miraculously, on Christmas Eve, we both experienced a sort of “awakening” to the idea that our joy would be found in the revelation of God in the simple, inter-personal connections, and not necessarily in the externals — sometimes, we need a refresher on that one. And so, experiencing a couple of beautiful and heart-felt moments, simple moments, with other people, ultimately helped to refocus and re-connect us with what counts. And ever since having my perspective adjusted, I’m feeling like I’m in a much better place, one where I feel I have something to offer again. I feel very inspired, and by the grace of God, seem to have an abundant amount of energy, which I know I’ll be needing. It’s a brand, spankin’ new year, one that has unlimited potential, and one that holds amazing opportunities for inter-personal connection so that our spirits can be touched and moved. And I can’t think of anything more hopeful than that! So for my first recipe offering of this new year (drumroll! ), I thought I’d start things off with a really neat idea that my hubby had for a comforting and warming stew (credit where credit is due, right?). And though it’s like the desert here in Southern California (it being 82° during the holidays probably didn’t help my attitude at the time), many of you are experiencing some very cold weather, and are looking for a simple and hearty stew to heat things up. 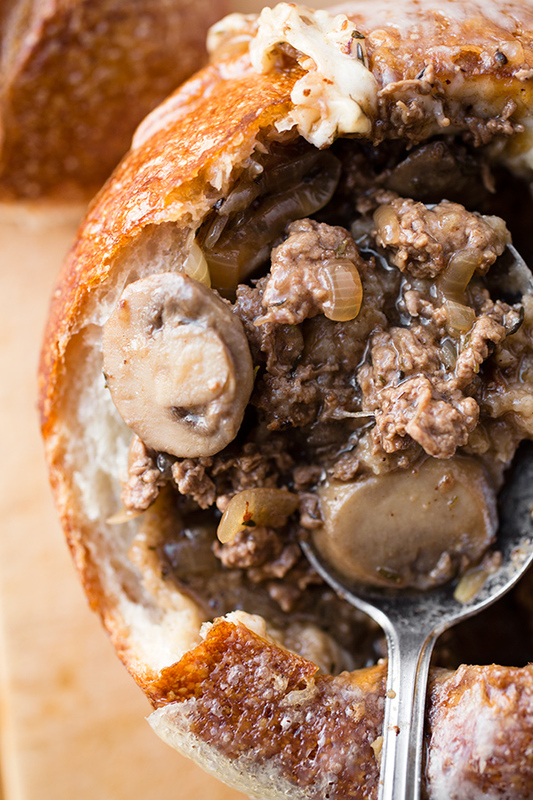 Philly Cheesesteak Stew has got all the goodies that we like getting piled high on the stick-to-your-ribs sandwich version of this recipe, only with this, we serve it up in a soft and chewy sourdough bread bowl, and dig into it with our spoons. Tasty, simple and perfect for the cold outside. So go warm your belly! Here’s to good things in 2014! Got any new perspectives so far that you’d like to share? *Philly Cheese Steaks often have sauteed bell peppers in ’em too—feel free to slice one up and add it in with the onions and mushrooms, if you so choose. -Add the thinly sliced beef sirloin to a large bowl, and season with a couple of pinches of salt and cracked black pepper, plus the onion powder, and toss to coat; sprinkle over 2 tablespoons of the flour, and again, toss to coat. -Place a non-stick pot over medium-high heat, and drizzle in about 3-4 tablespoons of oil; once hot, add about half of the sirloin in, and allow it to sear for about a minute or two, then toss/stir, and allow it to sear/brown on the other sides for another 1-2 minutes, and remove onto a plate to hold (the meat may still be a little pink inside); repeat with the remaining half of the sirloin, and set aside. -Next, add a little more oil to the pot if needed, and add in the sliced onions, along with a pinch of salt and cracked black pepper; allow the onions to caramelize for roughly 6 minutes, stirring frequently to avoid burning them, until golden-brown and softened; then, add in the mushrooms, and allow them to continue sauteing with the onions for another 6 minutes or so, stirring frequently. -Add in the dried thyme and the garlic, and stir to incorporate. -Once the garlic becomes aromatic, sprinkle in the remaining 2 tablespoons of flour (the tablespoons can be a bit “heaping”) over the onion/mushroom mixture, and stir well to combine and blend; next, slowly add in the hot beef stock, stirring all the while to avoid any little flour “lumps” from forming. -Reduce the heat to medium-low, and allow the stew to simmer gently for about 10 minutes, uncovered, just to “tighten” it up a bit, and to allow the flavors to marry; after 10 minutes, turn off the heat, and add the seared sirloin back in, along with any accumulated juices, and stir to combine; check to see if you need any additional salt/pepper. 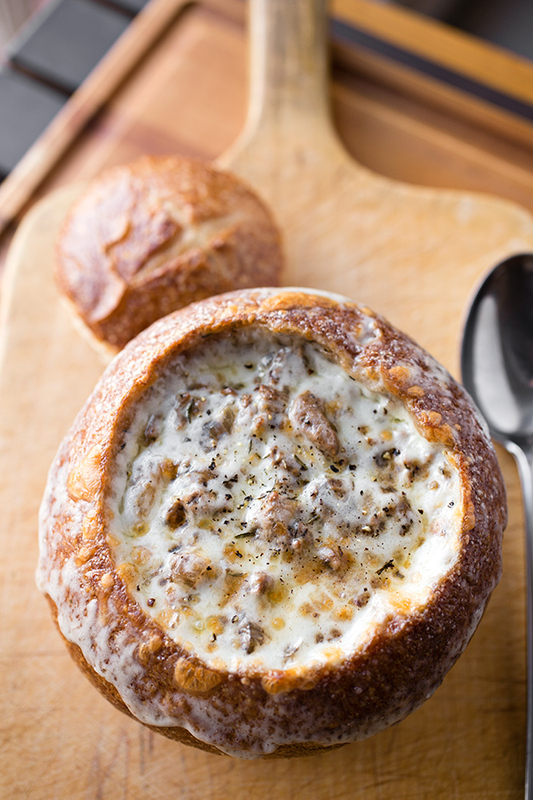 -To serve, ladle some stew into your hollowed out sourdough bowls, top with a slice of provolone, and place the bread bowls onto a foil-lined baking sheet and under the broiler for just a couple of moments to melt the cheese and make it gooey. -Serve with some of the hollowed out, left-over sourdough bread on the side, for dipping. What a delicious concept!! Looks super yummy!! WOW, I had to wipe a little drool there. You’re pictures are literally mouthwatering…I’m so trying this out this weekend. Made this for dinner tonite OMG this was great!!! Will be making this again soon. I am an avid recipe hoarder. I love recipes. I don’t know why, but we have a passion in life and mine is cooking and collecting recipes. The sad thing now though is I live alone with my dog as the kids have all grown up and moved on so there’s only me to cook for and I don’t make recipe inspired meals, just seems a waste of time to cook a special meal for myself. Never fear, I will continue to collect recipes and maybe I will get to use some of them for a party one day. The biggest problem I have with American recipes is some ingredients here in Perth, Western Australia, don’t exist so I have to rack my brain to think what I could buy that with the closest to what’s required. Could you please tell me all purpose flour plain or self raising? I’m by myself also and love to collect recipes. I will try this with modifications of canned mushrooms and ground beef instead of sirloin. This looks divine! I’m starting my new blog on Pinterest and was delighted for this to be the first meal onto my ‘main dish’ board. It has so many things I love combined together. I hope to make it soon- I’m trying to look at less scrumptious food online and actually cook some. That doesn’t always work out! I’m gonna go cruise around your site a few minutes and see what else I can find! Kudos to the Cook. It was love at first site or do I mean bite?!!! I made this dish this weekend and it was beyond delicious. Very satisfying comfort food. Thank you for your phenomenal recipe. Hi Liz! So glad you and your family enjoyed this one! 😉 And depending on where in in the country you live, chances are, it was a little bit of shield from the freezing cold outside! Thanks for the comment. I cannot even begin to describe how delicious this looks! Ohh, would love to make this in the crock pot! This was completely wonderful! My Husband is a Philly boy and loves a good cheesesteak – he loved this, too! I’d love to feature this recipe in my weekly soup post on my blog. Your FAQ says to contact for permission, so I guess I’m asking! Thanks so much, Lisa! Glad you both enjoyed this! I made this tonight with homemade bread bowls, it was great. I used 4 five oz steak fillets, and added one green pepper . This is a keeper! Thank you! Mmmm….homemade bread bowls, Maria? Sounds delish! So glad you you enjoyed this recipe! I want this NOW!! Thank you for sharing this and being so detailed in your recipe!! I love that!! Hi Chris, you’ve got to give this a try! Hope you enjoy. Hi Ann Marie, what a precious, precious comment you’ve left; thank you! And I’m so thrilled to have you along with me on my adventures in my kitchen, too! 🙂 Please enjoy my little tip-of-the-hat to your beloved Philly Cheesesteak! I made this recipe tonight and I must say how delicious this was. Everyone in our home (5 of us) including our 5 yr old loved it! At the first taste to me it reminded me of french onion soup. I just want to thank you for a wonderful meal and I look forward to making this again! Hi Jennifer, I’m so excited to read that! Glad this will be a meal that you and your family enjoy again! I usually don’t comment until I have made the recipe but I had to on this one. This recipe was shared on FB, and I just have to tell you …Thank you. This looks so amazing. I have everything, including the meat, to make this. 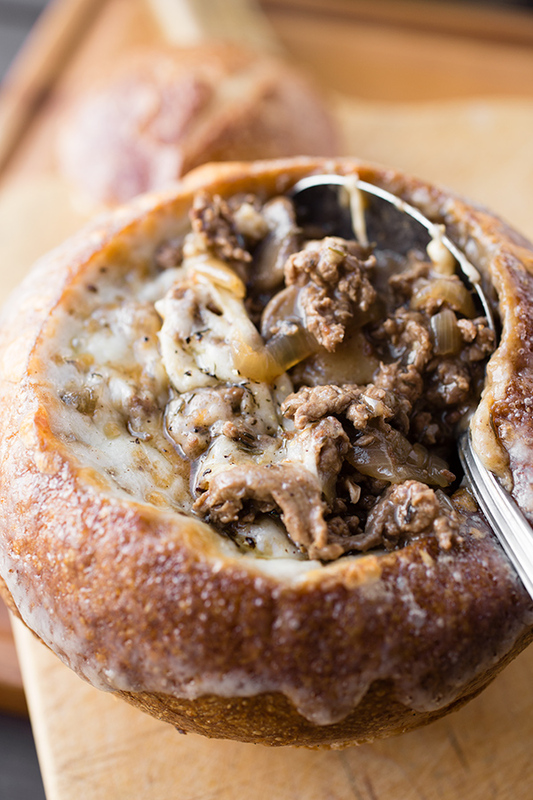 Also that I can make with out the bread bowl and it will low carb it will fill my husband and son’s craving for a Cheesesteak Sub! Great blog. Again thank you! Hi Martha, I’m so glad you did comment! (And don’t you just love it when you have the ingredients you need for a recipe on hand?) I truly hope you have fun preparing this hearty stew for your hubby and son’s cravings (with or without bread), and that it’ll be everything you hope for it to be! Thanks so much for stopping by, and happy cooking to you! Oh. My. God. This is so good it makes me want to cry. (Is that weird? Okay, yeah, it’s weird, but I really love my food). I am drooling all over the place. I need this in my life. I WILL have this in my life. Definitely making this. Just wanted to mention that Panera sells the bread bowls already hollowed out which can save a step! Hi Ami, yes— great tip! As a matter of fact, I purchased mine there. Philly native here. I don’t know why everyone else thinks we normally put green peppers in our cheesesteak. Where and how did this misconception ever start? The only times I ever see a “Philly Style” menu item with green peppers, it’s always somewhere outside of Philly/PA. Sure, it’s an option here, and I suppose whatever floats your boat… But a true, original Philly cheesesteak is bread, meat, and cheese (whiz or American, provolone’s debatable), “wit” or “witout” onions. I live in Philly myself and always wonder why people think this too. I made this stew tonight for dinner. It was so good! Instead of steak I used ground pork. I’m definitely making this stew again. I shared this post on my blog’s facebook and twitter pages. Hi Julie, that’s great! And thank you for sharing the recipe with others for them to enjoy! This sounds awesome, can’t wait to make it. Thanks for the recipe. Please send me more recipes, I love to cook. Again thanks. Hi Helen, not a lame question at all! 😉 You can just slice a good quality steak (a quick-cooking variety) very thinly, almost like “shaving” it, for the same result. Pretty much it’s just shaved steak. Hope that helps! This looks amazing! 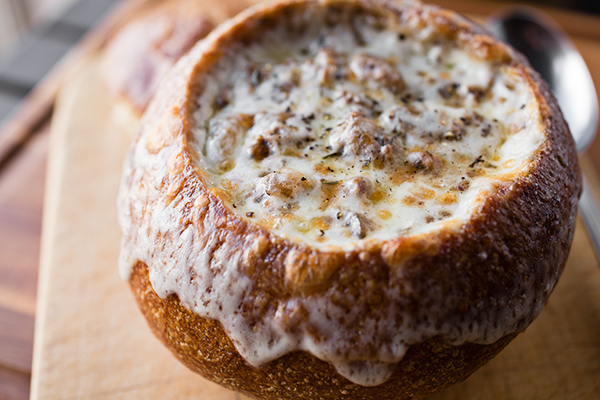 I have recently perfected the bread bowl and think this would be perfect in them! Jessica, that would be amazing! Hope you try this! As a 48 year old woman who has lived in Southeastern PA all her life, yes sauteed green peppers are often an option you get on your cheesesteak at any corner Italian place, banana peppers too, and provolone is a perfectly accepted cheese, although they are served on an Italian bread type hoagie roll, not sourdough bread, but that is your California spin on it and it sounds even more flavorful. My husband will be so excited to try this recipe!!!! And my father, who makes his own cheesesteaks at home, will be excited as well. I pinned this a while ago but finally made it tonight. I don’t eat beef, so I subbed ground turkey and low-sodium veggie broth and it was great! I’m sure it’s fabulous in a bread bowl but I went without to save carbs and instead shredded some cheddar right into the pot just before serving. Perfect for a chilly fall night. Thanks! Kristen, what a perfect way to “custom” make this recipe for your needs! So happy to read you enjoyed this! Made this for dinner A few weeks ago and it was a hit!!! soo good! Made this tonight! It was to die for but I suggest adding a couple of splashes of Worcestershire Sauce! It really added the “missing” flavour! This looks delicious! Any idea of the number of calories in a serving? Hi Jan! Thanks so much. You know, I don’t do calorie counts on my recipes, but I often refer people to this site to plug items in for some info: http://caloriecount.about.com . Hope that helps! After you saute and onion and/or peppers puree them in a blender with some of the liquid you are using. All the flavor, none of the gastric distress. This has worked as a solution for me for many years. I do it with soups, tomato/meat sauce, and chili. 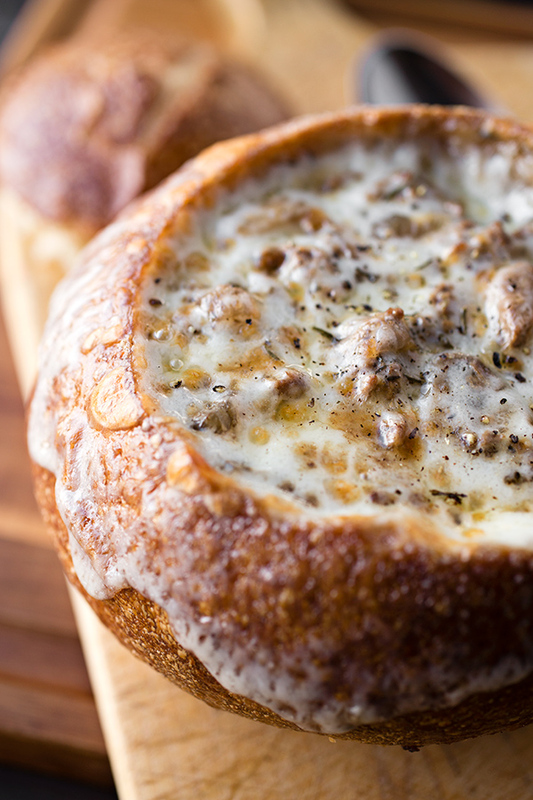 do you think this would freeze well (without the bread bowl)? Hi Robyn, I don’t see why not! As long as it has been completely cooled, you should be good to go in a heavy-duty, ziplock-type of bag. Hope you enjoy! Do you think one could make this in a crockpot without issue? Well, I didn’t get an answer but thought I would try it anyway in a crockpot, and it turned out great. I had to change the directions a bit to make it work, but that was minor. Delicious and easy to make. 🙂 thank you for sharing this recipe. Hi Hollie, I apologize for not being able to get back to you before you prepared this, but I’m thrilled to read that you went ahead and gave it go, and that it turned out so well! (This is one of those recipes that just works well wether you do it in the traditional way or in a crockpot.) Thanks so much for coming back to share your experience with me! Is this a soup I could make ahead a few days? Does it freeze well, do you know? Hi Stephani, you could certainly make this a few days ahead! (It will taste even richer with 2-3 days under its belt.) And if it’s only a few days, no need to freeze—but if you feel you need to, I think it would be fine. Just allow it to thaw in the fridge for a day or two. Hope you enjoy! I made this for dinner tonight, it was delicious! My kids and husband loved it! I applaud your efforts … I will try this recipe, however, seems like there should be green bell peppers also. Hi Donald! By all means—absolutely add in bell peppers. We leave ’em out for heartburn reasons, lol. This is my second time making this! A nice warm dinner for the -40 windchill up here in Canada !!! Thanks so much for sharing it’s definitely a favourite! Hi Tiffany, thanks so much for sharing that with me, and I’m thrilled that you’re enjoying this recipe! So glad it’s keeping you cozy and warm in chilly Canada! I am from Philly also. While green peppers are an option, it is not a standard on the Philly Cheese Steaks. They certainly are good though. Aside from Panera, where is everyone getting the crusty, personal size bread bowls from?? Barabara, thank you for your comments! As far as where to purchase those bread bowls, if you don’t have a Panera nearby, try a local bakery—usually the slightly more artisan bread/bake shops would have these. Hope you get to try the recipe! This turned out sooooo delicious. Thank you for sharing the recipe. I turned it up a notch while working it by adding 8 oz of cream cheese. Made for a richer flavor. Hi Peter, glad you enjoyed! And way to make this your own with the cream cheese! This was delicious! I added a chopped red pepper and a few dashes of worstishire sauce. My husband doesn’t eat bread so I just put his in a bowl, added the cheese on top and put it in the oven a few minutes for the cheese to bubbly. Thanks for the recipe. I am new to Pinterest and after lots of happy browsing, this was the first recipe I tried. The whole idea felt very comforting on a rainy fall day. It turned out as delicious as it looks. The only thing I would change next time is that I would use 3 cups of beef stock instead of 4 so it would be more like stew instead of soup. Also, although it looks pretty in a bread bowl it’s just too much bread for me. Instead I bought one bigger loaf of sourdough and cut it into think crusty slices which were great for dipping. Looking forward to trying more of your recipes! Kathy, so glad you made this! (And welcome to the world of Pinterest, lol!) Good that you made this according to your preferences—makes for the best experience. Thank you for sharing with me, and I do hope you give other recipes a try! So when you buy the meat at Trader Joe’s is it already sliced for you? Hi Anne, yes! All of their meats are already pre-packaged and ready to go, as they don’t have a butcher department in the traditional way, just good quality meats; so you’d just look for the “thinly sliced sirloin”, in a sort of vacuum pack-type packaging. Hope that helps! Hi Kevin, I’m so glad to read that. I always appreciate when a person preparing a recipe of mine receives my intention, and you did—you said your soul was warmed, and I couldn’t be happier. Thank you for your comments! Thank you for not insisting on green peppers here! This Philly native gets so very frustrated when she sees something labeled “Philly cheesesteak”, only to get to the list of ingredients and find it’s not Philly at all due to the inclusion of peppers. Only tourists go to Pat’s or Geno’s and get peppers (actually, only tourists go to Pat’s and Geno’s! 😉 ) This looks amazing, and I can’t wait to try it. I really hope you enjoy this tasty recipe that is in honor of that delicious sandwich— it’s my little ode to it, and another fun way to eat it. I wonder if round steak could be used like you would use in green pepper steak? Hi Mary, because round steak (or cuts from the “round” area of the cow) tend to be tougher cuts of meat, you would definitely need to cook it longer. The thinly shaved sirloin that I call for in the recipe is meant for a quick-cooking application, and needs only a few moments in the pan, and doesn’t get tough. But round steak would be tougher, and you would need to cook/braise it for at least a couple of hours so that it has the opportunity to “break down” and become tender in the soup. Found this recipe last year looking for something new to “present” to my family. The stew turned out amazing. I looked for bread bowls at my local Acme and only found one sourdough and one odd ball round. It was a hassle to find 4 bread bowls but I managed. Turns out Panera bread sells perfectly sized bread bowls, lol. I vowed to go there first the next time I made this. That day is today. Super excited to make this again for my family during playoffs. Hi Tina, Panera is my choice for these bread bowls—good size and delicious, so thumbs up on that! So glad you all enjoyed the stew, and I thank you for taking a few minutes to come back and share you experience with me!